What To Look For in the Best Survival Flashlight? Survival flashlights are just as the name suggests, they can be essential to your survival. In fact, they are an essential part of any survival kit. However when putting together your survival kit, you don’t want to use just any old flashlight you have lying around the house. You want to include the best survival flashlight around. So, how do you know what the best survival flashlight? When it comes to looking for the best survival flashlight there are multiple things that you need to consider. Accessories are one of the first things to consider because without them all you have is just a plain old flashlight. As you start to look closer at all of the choices you have, you will start to notice the better ones come with more than just a bright light or a long lasting battery. Many survivor flashlights come with different colored lenses such as green, red, and blue. Each of these colored lenses are used for a different purpose. Diffusers, which create a soft ambient light from the extra bright light, are also something to look for. Other accessories that you might want to keep your eye out for include weapon mounts, extra o-rings, holsters, a remote pressure switch, strike bezel, and among many others. Other things you need to consider are battery options and how many modes the model offers. After all, if the flashlight you are looking at for your survival kit only offers one mode, it isn’t going to be one of the better survivor lights. One of the biggest debates you will run across when it comes to survivor lights is what batteries to use in them. Survivalists everywhere have strong opinions on whether or not rechargeable or primary batteries are better. When it comes to primary batteries, most survivalists agree that you need to stay away from the alkaline batteries. Sure alkaline batteries are easy to find, you can pick some up in just about any store or gas station out there. However, these batteries also have a rather short shelf life, on average they last about five years before they start losing power. Another problem with primary alkaline batteries is they have a tendency to leak. Most dedicated survivalists who rely upon primary batteries find the primary lithium batteries to be the best choice, as they offer more power and a longer shelf life. After all, lithium batteries have been proven to hold at least 90% of their charge for longer than five years. Many survivalists feel that when it comes to batteries rechargeable batteries are the way to go. Rechargeable batteries pose fewer problems than primary batteries. With rechargeable batteries you have the choice between Li-Ion, and Ni-MH. Most survivalists prefer the Li-Ion rechargeable batteries because of their longer shelf life. While not quite as popular as Li-Ion batteries, more survivalists are starting to use Ni-MH. One of the advantages to Ni-MH is they are available in the same sizes and similar voltage as alkaline batteries, which means they can be used in the same flashlights as alkaline batteries. Now that we know what a survival flashlight is, the next question that needs to be answered is what is it used for. Honestly, a survival flashlight can be used for a variety of things. One of the most common things it is used for is providing light in an emergency situation. Whether you have broke down on the side of the road or the power goes out inside your home, your survival light is the perfect way to provide the light that you need. With the right accessories, you can have your choice between bright light and soft ambient light. Different colored filters can also be used for different types of light. 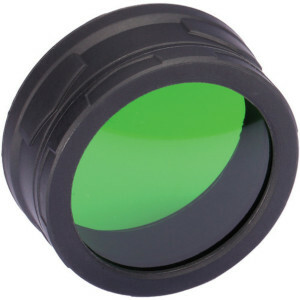 Blue filters provide the best light for reading maps at night, red filters preventing the destruction of your night vision, and green filters are ideal for hunting at night. Survival flashlights can also be used for self-defense in the form of a billy club. Even people who carry around other means of protection, such as a firearm or pepper spray, find survival lights to be useful as they can deliver a powerful blow to both humans and animals during the course of an attack. The best survival flashlights come with strobe patterns built in that can be used for signaling purposes. Whether you are trying to flag down a search party during an emergency, another vehicle, or just members on your hiking party the strobe patterns do all the work for you. Before moving on to the top survival flashlight remember that the flashlight that you have on you is the best flashlight, so please check out our article on keychain flashlights that are super small and easy to carry. When coming up with a best of guide for preppers and survival situations in regards to flashlights the main thing that kept coming up was the type of battery to use. After you decide if you want to work with primary (non-rechargeable) or rechargeable batteries you need to decide on the size battery you want to use. We prefer rechargeable batteries and they are available in all kinds of sizes. We broke this guide down by “Standard” and “Non Standard” sizes. Standard size batteries are the typical AA, AAA sizes that we all know we can pickup in any random store, if you want these to be rechargeable you will probably go with Ni-MH. Non Standard size batteries are the sizes that are outside of the AA, AAA type batteries. These are usually Li-ion batteries and some examples are CR123A, RCR123A, 18650, etc. As you scroll through the list you will clearly see that “Standard” or “Non Standard” is in the headline. Thanks and enjoy. Some of you might be surprised that the Elzetta Bravo made one of our best of lists because it is not one of the brightest lights out there. On its highest setting the Bravo only emits 650 lumens but only because this model comes with an Automatic Voltage Sensing head that allows for the higher lumen output. The other model only emits 235 lumens. The AVS head features an optical lens that comes with several different lens options. It gives you the ability to change beam patterns, on its lowest setting, which is engaged by twisting the tailcap. The tailcap also features a push button switch to power the light on and off. The reason why we rank the Elzetta Bravo so high on the list is because it is practically indestructible. The optical lens is the standard 7/8 inches thick but is one of the most durable on the market. The Bravo also features fully potted electronics, which adds to the lights durability. The thing about fully potted electronics is that it isn’t something that you normally find on flashlights. It is an important feature because it seals the circuit boards and solders joints, so they are locked into place. Another downfall to this light, which is easy to overlook, is that you can only use non-rechargeable CR123A batteries with it. The reason behind this is that non-rechargeable CR123A batteries are the best choice in emergency situations, and they are the most durable. The batteries themselves are not widely available because they are a non-standard battery, but they do have a long shelf life and an amazing output in terms of powering the light. If you read our previous survival flashlight review, you might remember the winner from last year was the Olight M22 Warrior this year we replace it with the Olight M23 Javelot. The best thing about the new winner is that it is very similar to last year’s winner, but offers an improved throw thanks to its dedomed CREE XP-L LED. One of the great things about this customized CREE XP-L LED is that it allows the light to reach up to 477 yards at night using its highest setting of 1020 lumens. The M23 Javelot features three different modes, along with a strobe mode. The highest mode reaches 1020 lumens for five minutes, mode two emits 350 lumens for two hours, and mode three is the lowest mode and emits 20 lumens for 30 hours. 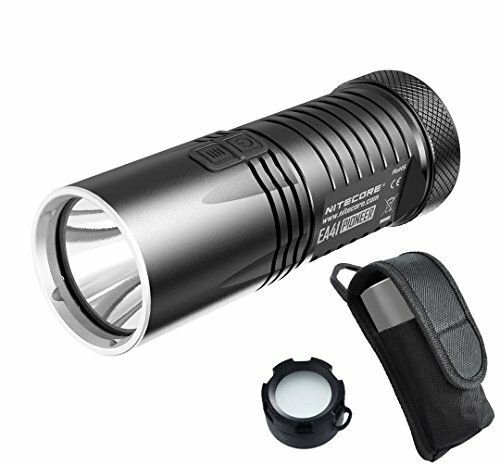 The flashlight is considered a non-standard light because it requires two CR123A lithium batteries or a single 18650 lithium ion battery to run. At just under six inches long, this light is small enough to carry with you. It is also versatile enough to be used in a variety of settings. The tail cap is extremely stable allowing you to stand the light on its end to provide light for an entire room while freeing up your hands. The light comes with a holster and diffuser, which allows you to turn the beam into diffused light to better light up your surroundings. The Eagletac GX30A3D makes our ‘Best Of list’ for a handful of reasons, but perhaps the most persuading is the fact that it is really two flashlights in one. The GX30A3D offers a spotlight that is almost as bright as lights powered by four AA batteries, but the light also comes with a diffuser mode. The diffuser mode allows users to use the light as a candle or even a lantern with its flood beam. 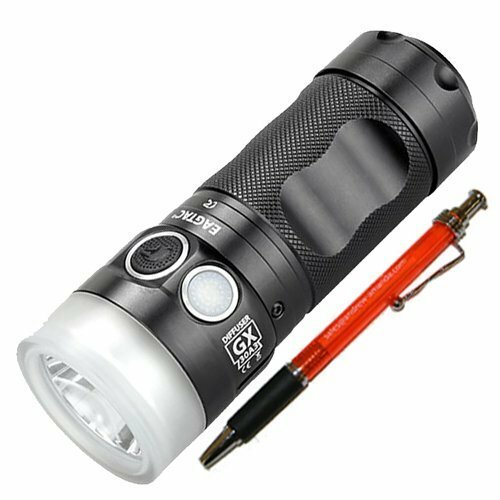 The GX30A3D features a CREE XP-I hi V3 cool white LED that is powered by three AA batteries, which makes this light a standard flashlight. The beam from the light can reach up to 492 yards. The lens itself is a white glass that features anti-reflective coating on both sides as well as a hardening treatment to help make it durable. One problem many standard lights have is the light dims after running for a certain period of time, but the Eagletac GX30A3D features a constant current regulation to prevent the light from dimming on every output level. Being that the light is really two lights in one, the amount of lumens emitted for each setting will vary based on what light you are using. With the spotlight the highest output is 1330 lumens for one hour, while the diffuser option provides 1000 lumens for one hour. The modes, which include five brightness levels for both spot and diffuser settings and three hidden auxiliary modes, are all accessed via the tail cap switch, plus this switch makes tail standing possible. The Nitecore EA41 makes our list as one of the best standard main light for those of you who are on a budget. Nitecore recently released a new version of this light in 2015 and that is the one we will be focusing on in this review. Like the version before it the new EA41 features a CREE XM-L2 U2 LED that is strong enough to emit up to 1020 lumens for up to one hour and 45 minutes. The EA41 is powered by four AA batteries and features five different brightness levels, as well as strobe and SOS modes. The Nitecore EA41 comes with a power indicator light that alerts you to how much battery power is remaining. The compact light is simple to use because it comes with two different switches: One for powering the light on and off and the other for switching between the different modes. The 2015 version comes complete with a Lumentac diffuser, which allows you to easily switch between throw and flood depending on your current needs. The EA41 offers a sturdy and durable hard-anodized HAIII military grade body with a mineral glass lens featuring anti-reflective coating. The one downfall to this light is that it can get extremely hot to the touch after being used for an extended period of time. The light will also step down brightness levels to help prevent the light from overheating. 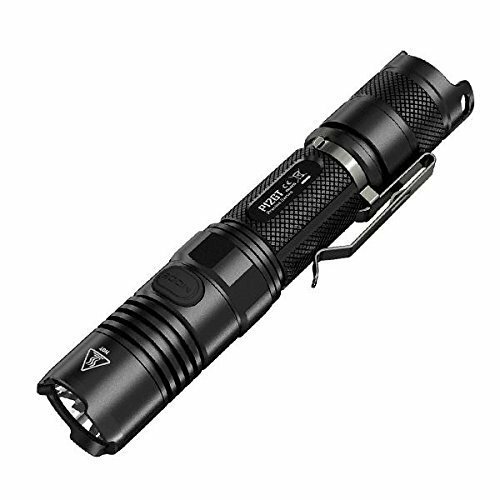 The Zebralight SC600 MK III is an ideal back up or one of the Best EDC flashlights due to its small size, and its light weight body. Although the light is only 3.8 inches long, it can easily light up a room or temporarily blind a potential attacker. The SC600 is powered by a single 18650 battery, but that one battery can do so much more than you might think. The SC600 MK III offers you three main brightness levels (high, medium, and low), but each of those three levels can be further programmed to two different sub-levels. Even better is that the second sub-level offers even more brightness choices for users. The highest level of brightness offers users 1300 lumens for a period of two hours while the lowest ordinary brightness level is three lumens for 18 days. Now 1300 lumens is pretty bright, but along with that brightness comes heat. Using and operating a flashlight at that high of an output can put the light at risk, so Zebralight uses PID thermal regulated outputs for the two highest levels of light. The SC600 MK III features a beacon strobe mode, as well as a battery indicator light. The battery indicator can be started by four short clicks and how much battery you have left will depend on how many times the LED flashes. To help you conserve battery power when running low the SC600 will automatically power down to lower modes. One of the most important things about an EDC light is that it is something that you will be able to easily carry around with you no matter where you go. Some lights that claim they are EDC lights are a bit bigger and bulkier than other models, making them a bit of a pain to carry in a pocket or even a purse. Now the Olight S1 puts almost all other EDC lights to shame with its small size and its lightweight body. In fact, the Olight S1 is referred to as the smallest side-switch LED in the Olight product line. If you purchase this light you will want to hang it on a lanyard or keychain, so you don’t accidentally lose it. While this light at 2.4 inches long is one of the smallest lights you will find, its small size doesn’t affect its brightness. The Olight S1 can emit up to 500 lumens for a period of about 1.5 minutes, which is plenty long enough to temporarily blind somebody. The S1 also offers a Moonlight mode in addition to its three main modes. 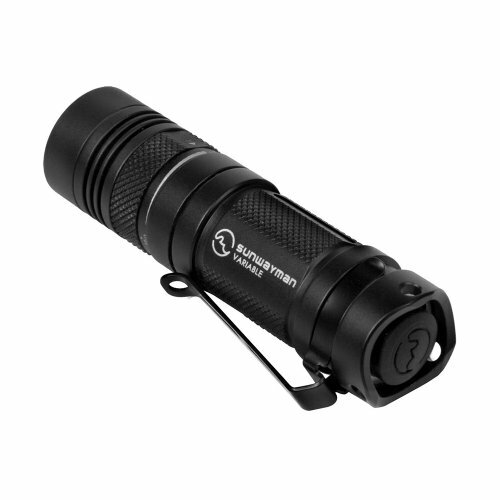 Moonlight mode allows you to keep your night vision intact since it emits a mere .5 lumens. 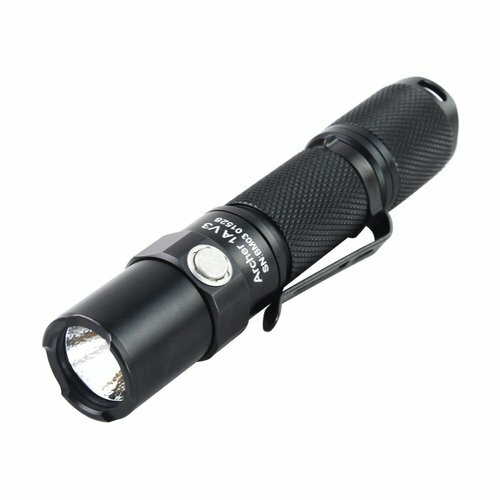 This non standard EDC light can run on two different types of batteries a CR123A or a RCR123A. The best option is the RCR123A, as the Olight S1 bundle comes with a battery and a compact Lumentac charger. The charger is small enough to take with you along with the light, so you can always have an extra battery with you. Plus with the protected RCR123A battery you won’t have to worry about it overcharging or shorting out. The battery itself will deliver a steady 3.7V and allows your light to provide you with the same level of luminosity throughout the duration of the battery’s life. One of the great things about the Sunwayman V11R is how compatible it is. With the Sunwayman V11R you can use three different types of batteries. 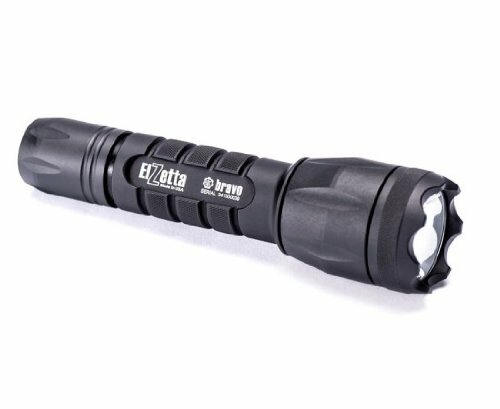 Compatible batteries for this EDC light include the CR123A and the RCR123A, the 16340, and a good old AA. For this review we are going with the single AA option because it is a standard size light we are covering. In order to use the AA battery, you must also use an AA extender, which should come with the light upon purchase. Even with just a single battery, you can expect a maximum of 500 lumens with this little light. Even better though is the Magnetic Control System that Olight uses. The MCS allows users to select any brightness level ranging from one to 570 lumens rather than relying on distinct modes. To select your brightness level all you have to do is twist the rotator ring from left to right or right to left, depending on if you want more or less lumens. If you are going to use the light on full power, Olight recommends that you do not use it for longer than five minutes because the heat from the light can cause the body to be too hot to touch. Like many other Olight flashlights, the S1 comes complete with two switch assemblies: Your traditional rubber tail cap that is soft and easy on the fingers or the all metal tail cap switch that is also easy to use and exquisite in appearance. The first thing that you need to know about the Thrunite Archer 1A V3 is that it is an updated version of the Archer 1A V2. The best part about this updated version is that it features an even better UI, this UI is much more user friendly than the previous version and uses a momentary forward click switch to operate. The Archer 1A V3 uses a single AA battery, which makes it one of the easiest lights to power because you can always find an AA no matter where you go. The Archer 1A V3 offers users the choice between five different modes. Users have the basic high, medium, and low modes, but they also have access to Strobe and Firefly mode. The Archer 1A V3 comes complete with a memory function, which can be set to any of the different modes on the light except strobe. The memory function makes it easy to return to your last used mode, so no more having to flip through the various modes to find the one you want. One of the downfalls to carrying around a flashlight is that you can accidentally turn it on, which drains the battery, and you won’t have it for when you really need it. To prevent the light from turning on by accident, Thrunite uses a U-shaped groove in the tail cap. This U-shape also makes it easier to turn the light on in the dark because you can feel the groove and move forward from there. The Thrunite Archer 1A V3 also features a strike bezel making it an excellent self-defense tool. 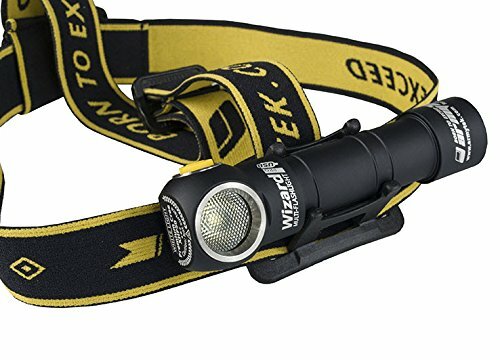 The Armytek Wizard Pro is simply an amazing headlamp. The Wizard Pro offers users 2300 lumens, which is more than enough to light up any dark cave or mountain trail. The best part is that these 2300 lumens are a constant, zero fluctuation, even as the battery is losing life. The constant brightness of this headlamp is due to the powerful electronics used in the light as well as the active temperature control. Being able to emit 2300 lumens for a period of one hour means the light can easily and quickly heat up. To help keep you aware of the headlamps operating temperature there is a multicolor warning indicator, which will also keep you up to date on your battery life. The advantage to using a headlamp is the fact that your hands are completely free so the last thing you want to do is have to fumble around trying to operate the Armytek Wizard Pro. To ensure you are not fumbling around in the dark, Armytek uses a side switch that you can easily use with just one hand regardless whether you are turning the lamp on or switching between the modes all it requires is one hand. Wearing a headlamp might not sound like the most comfortable idea, but Armytek has created a comfortable headband that will remain perfectly in place even if you are out for your evening run. The lamp itself offers a very solid body, and it doesn’t contain long wires, bulky boxes, or even weak rubber connectors. The body of the lamp is built to withstand a fall from up to 32 feet. One of the downfalls to headlamps is how exposed they are to just about everything, but the Wizard Pro was designed to be fully protected from dirt, dust, and even water. It has been shown that the light will still continue to work at water depths of 32 feet. 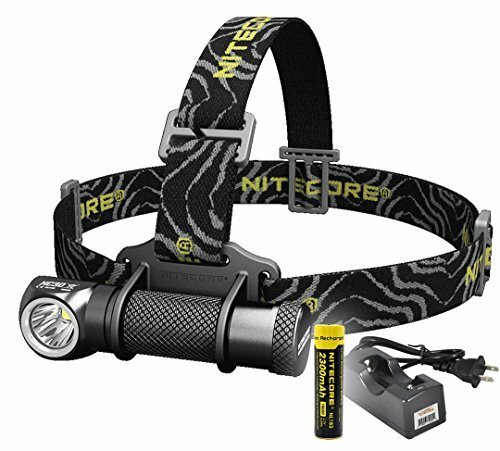 The Nitecore HC30 headlamp is a great choice for those of you who need a hands free light but are working within a budget. The Nitecore HC30 is compatible with two battery sources, the 18650 or the CR123. Using the CR123 batteries you will need to use two, but you will greatly enhance the headlamp as it provides more power and longer run times than a single 18650. The HC30 offers users the choice of five different brightness levels: Turbo, high, mid, low, and ultralow. Turbo mode emits a maximum of 100 lumens for up to one hour while the Ultralow setting emits a single lumen for over 300 hours. Nitecore also included three concealed modes that are designed to be used in emergencies: Location beacon, SOS, and strobe. All of these modes are accessed via a head switch that can easily be operated with a single hand. One of the reasons why we like this headlamp so much is because of its uniform and consistent coverage, which is due to the Precision Digital Optics Technology created and used by Nitecore. The HC30 is also one of the best headlamps out there for a variety of outdoor activities because its beam illuminates everything in the user’s field of vision thanks to the wide beam optics. Another problem that Nitecore has solved are dead zones – those areas where you have virtually no illumination. To solve that issue Nitecore uses a 90 degree rotatable head. Even better is that the head rotates up and down. Wearing a headlamp might sound fine, but some headlamps grow hot to the touch when using maximum lumens – Not the HC30! This model features effective cooling fins coupled with a CNC Machined Unibody head. The cooling fins allow optimal heat dissipation no matter what mode you are using. In addition to the cooling fins the HC30 features advanced temperature regulation technology that adjusts the output of light based on the lights internal temperature, which prevents any damage from overheating. If you read our review from 2015, you might have noticed that the Fenix HP25 was listed there as the best headlamp. 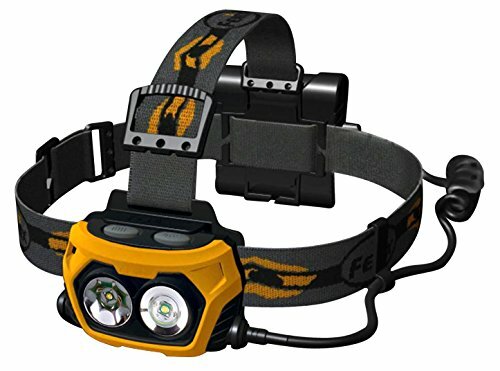 The interesting thing is that despite all of the new lights that have come out and the updated technology being used, we still feel that the Fenix HP25 is the best standard headlamp in the market. If you look at the description of the light you will see that it says a maximum of 360 lumens, but on our product highlights we tell you the highest setting is 180 lumens. Which one is correct? Both are an accurate! How this works is the Fenix HP25 has two light sources, but both are individually controlled. One light source is for spot light combinations and the other delivers flood light combinations. Using only one light source at a time provides you with a maximum output of 180 lumens, but if you use the two light sources together you get a total of 360 lumens. Not only that but the light sources provide you with up to 20 different lighting patterns, so you have something available for every situation. The spotlight beam can reach up to 502 feet, while the floodlight beam provides you with a 90 degree wide beam. The head features a 60 degree tilt mechanism that allows you to focus and adjust the beam to where the light is needed, plus the lockout design prevents accidental activation. 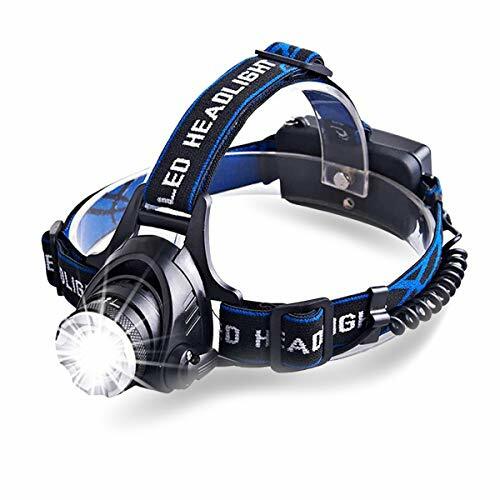 With how unique this headlamp sounds, you would think it needs some specialized batteries. In reality the headlamp is ran off of four AA batteries, which can be found anywhere you go. The Fenix HP25 is also hard hat compatible, which makes it the perfect all around headlamp. If the Fenix HP25 is a bit too much of a light for you or is just a bit out of your price range, the Fenix HL23 is a close second. Unlike the HP25, the HL23 only features one light, which is the CREE XP-G2 R% LED that has a lifetime of about 50,000 hours. 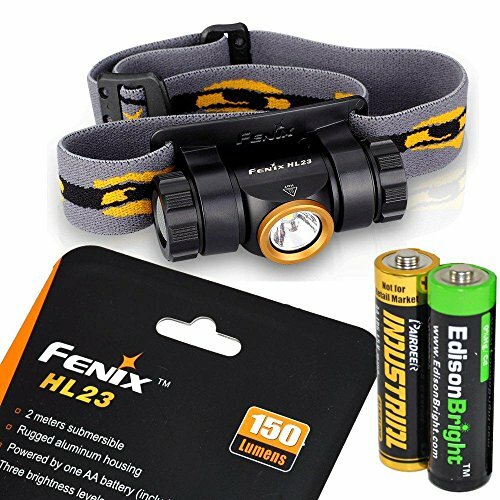 The Fenix HL23 uses a single AA battery, which you can use the ordinary Alkaline ones or you can use Ni-MH batteries. No matter what battery you choose you will still get the same lumen output, but the light will last longer on low mode using the alkaline battery. While on high and mid mode the Ni-MH battery allows for the longer runtimes. The HL23 offers a 180 beam distance with a digitally regulated output that ensures constant brightness. Like many other headlamps the HL23 features single button operation, which allows you to access everything the lamp provides with just one hand. The HL23 is a true outdoor focused light and it can take pretty much anything you throw at it as it comes with an IP68 rating, features an IPX-8 rating up to six feet underwater, and can survive falls from about three feet. If you have ever visited our page before, chances are you have seen numerous reviews on the LRI Photon Freedom. We have included this light in several different categories, including Best Keychain Flashlights because this light really is one of the best. This compact is one of our favorite lights and we think you will enjoy it too. We find this light to be one of the most useful lights, so trust us when we say you should have more than one of these on hand. The more LRI Photon Freedoms you have the better because then you can have one in every place that you could ever need a light. Coming in at just 1.5 inches long this light might be one of the smallest in the EDC market but don’t let its small size fool you. The light provides users with a steady 4.5 lumens for over a 12 hour period on just one tiny battery. The LRI Photon Freedom offers four different modes to choose from as well as a Morse Code mode, making it one of the most versatile keychain lights on the market. Even though it is small, it is one of the most durable lights around because it features an IPX-7 rating, a glass-filled polyurethane rating, and an unbreakable LED, which makes it virtually indestructible. 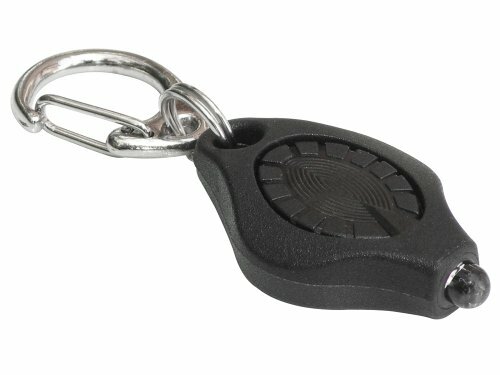 With the quick release key ring that comes standard with the light, you can use the LRI Photon Freedom to replace any zipper pulls on bags or jackets. You can also clip it to your cap, computer, clothing, and more with its Hands-Free clip accessory. Once you have purchased your survival light the next, thing you need to think about is how you are going to power your light. Having one with you is the first step to being prepared, but what happens when those batteries die? Some survivalist carry around a bunch of extra batteries, but what happens if you forget batteries or are stuck out in the wilderness for longer than you had originally anticipated? Basically anything can go wrong and you should always expect the unexpected, which is where the survival/bug out kit comes into play. In this kit you will want to carry some extra batteries for your light, but you will also want to include three other useful tools that allow you to charge your battery while on the go. The first item on your list is a solar charger. As you might have guessed the solar charger gets its charge from direct sunlight, so you can hang it on your backpack to charge it as you hike. The other two items are a USB battery and a battery charger. These three items are going to work together to help ensure your flashlight is always ready when you need it. In theory your solar charger will hang on your backpack to charge as you go about your day, so it is fully charged whenever you need it. Your USB battery, also referred to as a power bank, should be fully charged before you head out, so you can plug your battery charger into the power bank when your batteries need charging. Once your power bank’s charge has been depleted, plug it into the solar charger to recharge. This will make sure your power bank is ready the next time you need it. While this is how it should work in theory, you can also use the solar charger to charge the battery charger along with many other things. If you are looking for a solar panel that is lightweight, yet powerful, the Enerplex Kickr IV Solar Panel is the ideal choice for you. The panel is made from a patented solar-on-plastics thin film, which makes it extremely lightweight – it only weighs 0.6 pounds. With how lightweight the panel is, you will never even notice it hanging from your pack. Although extremely lightweight, the panel is amazingly powerful. It is 6 watts of true output. What that means for you is that it will charge a variety of electronic devices as fast as any wall outlet. With it being lightweight, many of you might worry about how durable it is especially because you will be using it outdoors. The Enerplex Kickr IV is extremely rugged. It was designed to withstand extreme conditions, including water, punctures, drops, and even shocks. If you are going to be relying on a portable charger while exploring the outdoors you don’t want just any old charger. You need a portable charger that will withstand the most rugged conditions and one that will work when you need it to. 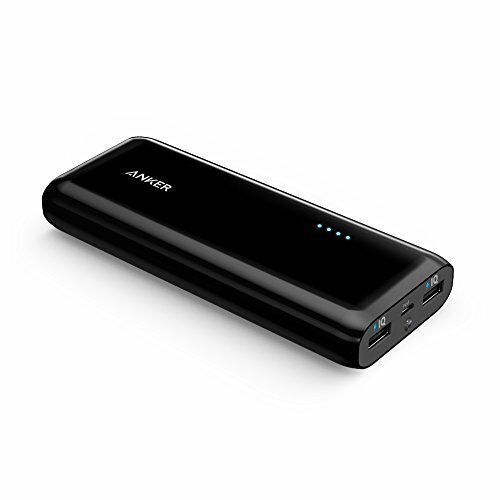 Enter the Anker Astro 13000mAh Portable Charger. When packing a bug out kit, you want something that is not going to take up a lot of room. The Anker Astro offers a slim design and it packs a lot of power. With up to 13000 mAh of power, you have plenty of power at your fingertips. Anker Astro uses PowerIQ technology to ensure your device charges as quickly as possible regardless of the device. How this works is the PowerIQ technology allows each port to identify your specific device, and it allows the charging port to speak to the devices charging to improve charging time. The Anker Astro is also one of the more user friendly ones on the market. It relies on a single button to operate. The best part is the button is located perfectly for your thumb to control while it is resting in your hand. This one button allows you to turn the device on or off as well as check the power level and operate the flashlight. In order to charge your rechargeable batteries in the outdoors, you are going to need a reliable battery charger to plug into the portable charger. The Xtar VC2 Plus is currently our favorite option because it offers you reliability at a reasonable price. One of the best features is its ability to revive damaged batteries to help save you money due to its XTAR OV Activation Function. The charger is also compatible with any 5V USB power, so it works perfectly with the USB charger we just featured. 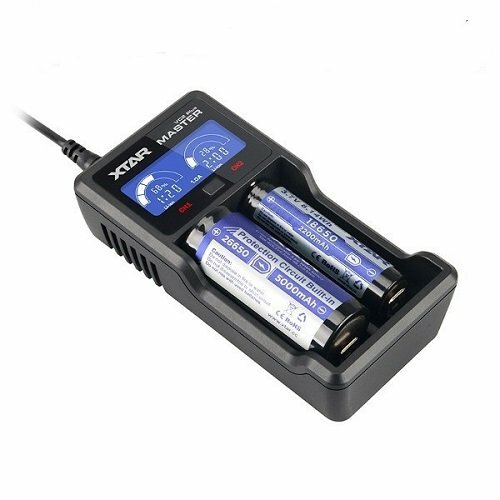 The Xtar VC2 will stop charging once the charge has completed plus it has a restart charging function that keeps the batteries safe inside the charger if they are left in overnight. The VC2 is one of the smartest chargers on the market as it offers a countdown timer for each bay, so you will always know how long you have until your batteries are ready. Even better is that both bays will work at the same time even if you are charging one Li-ion and one Ni-MH battery. The best survival flashlight is so much more than a long lasting flashlight, it is can be a lifesaving device. Survival flashlights can be used to provide bright or ambient light with the right filters and diffusers in an emergency, but they can also be used for self-defense. The heaviest ones make the best billy clubs. But, with all of the choices out there how do you find the best survival flashlight for you. What one you end up with will really depend on what you plan to use it for. 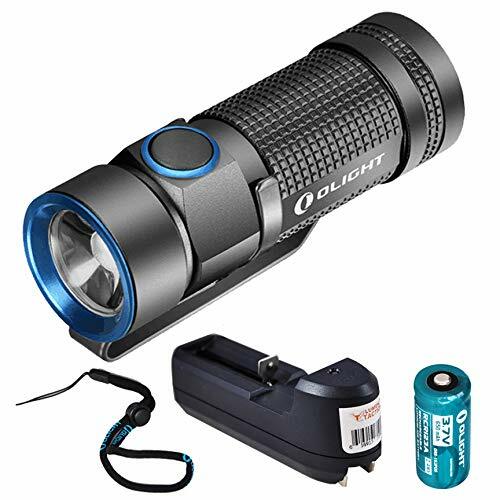 Are you looking for a bug out bag flashlight or are you looking for something that can also be used as an every-day-carry flashlight? When looking for the best survival flashlight you need to take into consideration what modes the flashlight offers, as well as what accessories come with the light and what ones can be purchased separately. No matter what you end up with, we want to thank you for taking the time to read this article you may want to read through our other “Best Of” flashlight articles. If you have any questions about the vocabulary used in this article, please refer to our flashlight buyer’s guide. For comparison purposes, please use our Flashlight Comparison Guide, where you can sort through the flashlights based on specific specifications. If you liked what you read, please follow one of our links to Amazon to purchase one of the best survival flashlights. This site is part of the Amazon affiliate program and we receive a small commission from Amazon with no extra cost to you for purchases made through one of our links. Thank you for reading.